Ever since motor racing began in the late 1800’s, Mercedes and Benz have been participating and winning. As they joined their efforts together the tradition continued and in the last 120+ years they have been very successful indeed. With only a few interruptions, due to wars or accident, the Marque from Stuttgart has championed successfully over many competitors and in all forms of racing they have entered, even to this day. Both Marques, Daimler-Motoren-Gesselsvhaft and Benz Patent-Motorwagen, independently enjoyed success in the sport of motor racing throughout their separate histories. A single Benz competed in the world's first motor race, the 1894 Paris–Rouen, where Émile Roger finished 14th in 10 hours 1 minute. 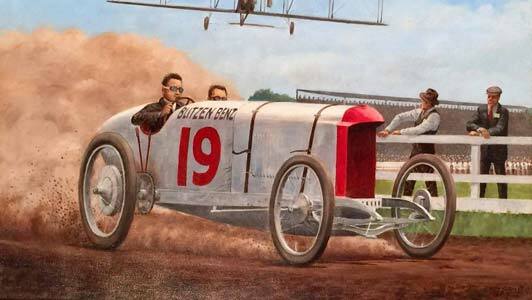 The Mercedes Simplex of 1902, built by DMG, was Mercedes' first purpose built race car — much lower than their usual designs — which were similar to horse carriages; that model dominated racing for years. In 1914, just before the beginning of the First World War, the DMG Mercedes 35 hp won the French Grand Prix, finishing 1-2-3. Karl Benz's company, Benz & Cie. built the "bird beaked", Blitzen Benz that set land speed records several times, reaching 141.7 mph in 1911. That record gained that model the reputation of being faster than any other automobile — as well as any train or plane. They were already constructing many aerodynamically designed race cars. Benz was involved in Grand Prix motor racing from 1923, when the Benz Tropfenwagen, described as having a teardrop shape, was introduced to motorsport at the European Grand Prix at Monza. These, the brainchild of Benz chief engineer Hans Nibel, were inspired by the Rumpler Tropfenwagen and were intended to increase public acceptance of mid-engined cars. They resembled the later Auto Unions, and used the virtually unchanged Rumpler chassis. They were fitted with a 1,991 cc 80 hp inline six producing and demonstrated "impeccable roadholding" at 90 mph and above. Despite a promising start, with a fourth and a fifth in their debut, they did no better in three years of Grands Prix and hillclimbing, and the expected public acceptance did not materialize. Financial difficulties led to a merger with Daimler. But when the two companies were merged to form the Mercedes-Benz brand in 1926, they continued their relentless campaign of excellence. 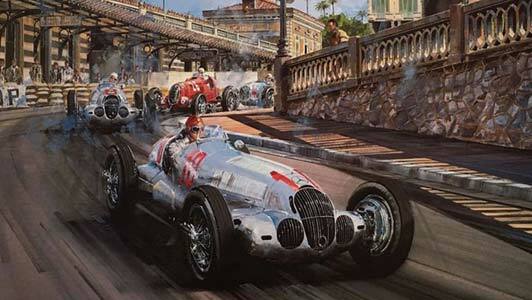 In the 1930s, the new joint company, Daimler-Benz, with their mighty Mercedes-Benz Silver Arrows, dominated Grand Prix racing in Europe together with its rival, Auto Union. 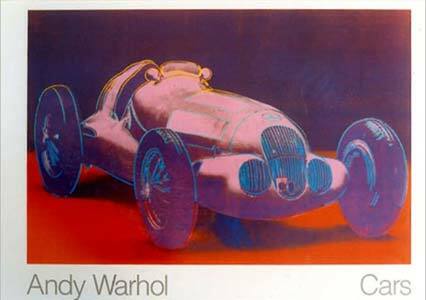 In fact the colour of the cars, which was later to become legendary, was unintentional - they had initially been painted white as was traditional for German cars, but the paint was stripped away to reduce weight. The cars set speed records up to 270 mph. The team was guided by the great racing team manager Alfred Neubauer until the company ceased racing at the start of WWII. In 1954 Mercedes-Benz returned to what was now known as Formula One racing, in which a World championship having been established in 1950, using the technologically advanced Mercedes-Benz W196 which was run in both open-wheeled and streamlined forms. Juan Manuel Fangio, a previous champion (1951) transferred mid-season from Maserati to Mercedes-Benz for their debut at the French Grand Prix on 4 July 1954. The team had immediate success and recorded a 1-2 victory with Fangio and Karl Kling, as well as the fastest lap, set by Hans Herrmann. Fangio went on to win three more races in 1954, winning the Championship. The success continued into the 1955 season, where the same car was used again. The team's drivers, Fangio and the young Stirling Moss, won 6 of the 9 rounds between them, and finished first and second in that year's championship. 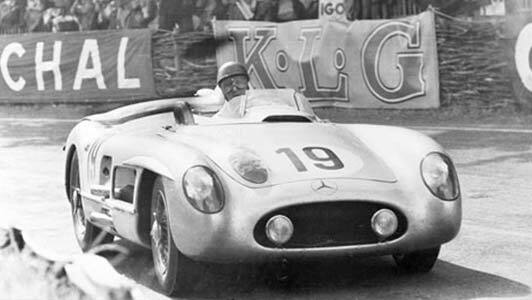 Following the 1955 Le Mans disaster, Mercedes-Benz withdrew from all factory-sponsored motorsport. Mercedes made its return to Formula One in 1994 as an engine supplier to Sauber, with whom they had already enjoyed success in sportscar racing, after 1993 funding their engine partner Ilmor, Mercedes and Sauber announced that the teams engines will be rebadged "Mercedes-Benz" for the 1994 season signaling Mercedes return in participation of the series for the first time since 1955. In 1995 they began supplying engines to the McLaren team, which truly started the resurgence of the brand. 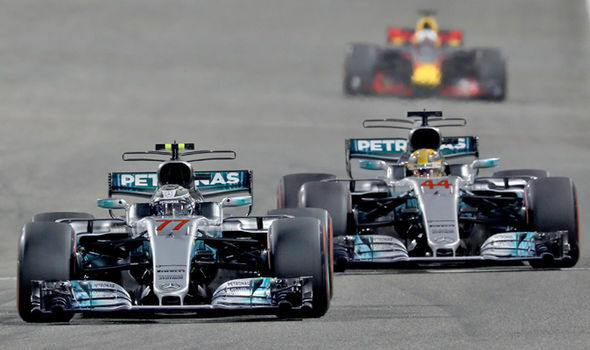 Outside Formula One, Mercedes-Benz had increased its shareholding in the Ilmor company in 1996 and took full control nine years later, eventually rebranding as Mercedes AMG High Performance Powertrains. They have continued to design and build engines for McLaren. In the opening race of the 1997 Formula One season, David Coulthard produced victory for McLaren and ushered in a new era of success for the British based squad. Coincidentally this was the first race in which McLaren had competed with a silver livery due to West replacing Marlboro, who moved to Ferrari, as title sponsor. The colour drew inevitable comparisons to the Silver Arrows of a previous era, and the nickname was applied to the McLarens. This was a significant result in F1 racing, McLaren's first victory for three seasons and the first win for Mercedes-Benz since Juan Manuel Fangio's success at the 1955 Italian Grand Prix. On November 16, 2009, it was announced that Mercedes would part ways with McLaren, and instead purchase a 75% controlling stake in the 2009 championship-winning team Brawn GP. The team, reimagined as Mercedes GP, debuted at the 2010 Bahrain Grand Prix, with an all-German driver line-up of Nico Rosberg and Michael Schumacher. 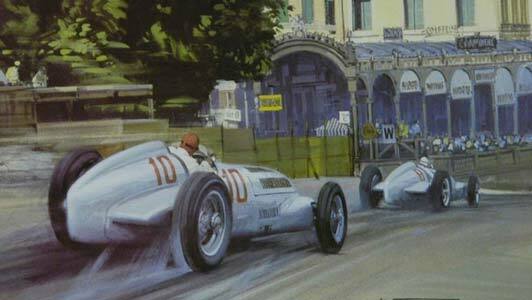 It was in 1952 that Mercedes-Benz returned to racing after the war, again with Alfred Neubauer as team manager. Their small and underpowered gull-winged Mercedes-Benz 300SL, won several races in 1952 including the 24 Hours of Le Mans, the Carrera Panamericana, and did well in other important races such as the Mille Miglia. 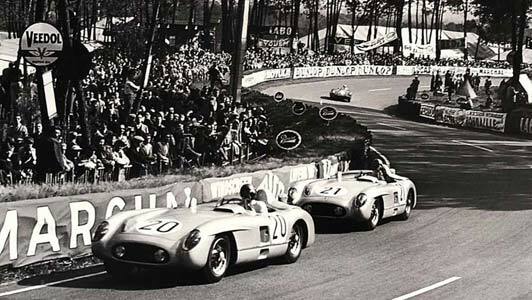 Mercedes-Benz was also dominant in sports car racing during the 1950s. The Mercedes-Benz 300 SLR was derived from the W196 Formula One car for use in the 1955 World Sportscar Championship season. At Le Mans that year, a disaster occurred in which a Mercedes-Benz 300 SLR collided with another car, killing more than eighty spectators. In fact in the aftermath of the Le Mans disaster, it would be several decades until Mercedes-Benz returned to front line motorsport. In the late 1960s and early 1970s, Mercedes returned to competition through the tuning company AMG, later to become a Mercedes-Benz subsidiary, which entered the big Mercedes-Benz 300SEL 6.3 V8 sedan in the Spa 24 Hours and the European Touring Car Championship. In 1985 Mercedes-Benz returned to the World Sportscar Championship as an engine supplier for the privateer Sauber team. The first car produced by this relationship, the Sauber C8 was not particularly successful. However the successor, the C9 won several races, including 24 Hours of Le Mans in 1989. 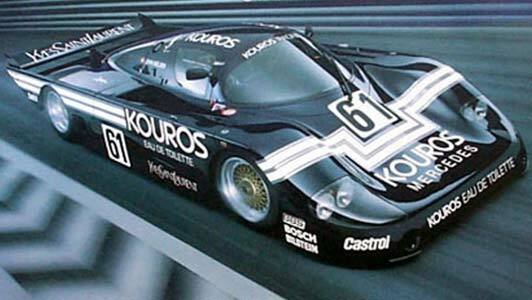 After the Sauber team parted company with their sponsor Kouros at the end of 1987, Mercedes-Benz increased their involvement with Sauber for the 1988 season to become a factory entrant under the Sauber-Mercedes name. Still using the C9 the team won 5 races but came 2nd to the TWR Jaguar team in the championship. However, 1989 was to be a different story with Sauber-Mercedes winning all but one championship race to become world champions (including coming 1st and 2nd at the24 Hours of Le Mans - all achieved with the C9. For the 1990 World Sportscar Championship season the C9 was replaced by the all-new C11, while the team was renamed Mercedes-Benz. The team dominated the season, again winning all but one race to become world champions. Mercedes-Benz returned to prominence in sportscar racing in 1997, with the CLK GTR which was entered in the new FIA GT Championship world championship series. In its first year, the CLK GTR won the championship and the drivers' championship. It would again dominate the FIA GT in 1998, and would go on to win its second championship in a row. The CLK GTR would be the last car to win the FIA GT Championship. In 2011, Mercedes-Benz announced that a GT3 version of the Mercedes-Benz SLS AMG would be made available for private racing teams. Beginning that year, the SLS AMG GT3 has taken numerous endurance racing wins at the 24 Hours of Dubai, 24 Hours of Nürburgring and 24 Hours of Spa and has won many other races in national and global GT3 championships. In 2015, the new Mercedes-AMG GT3 was launched to replace the SLS AMG GT3. 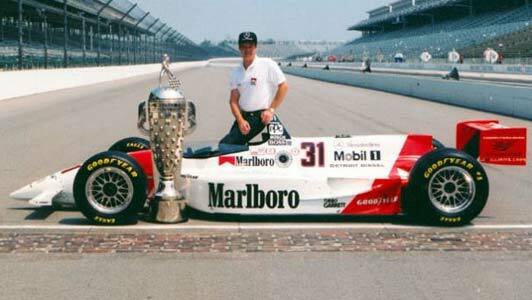 In 1994, Al Unser, Jr. won the Indianapolis 500 with a Penske-Mercedes IndyCar. Mercedes-Benz which, realizing that a loophole in the rules for production-based engines would include any pushrod engine, built a very unusual purpose-built pushrod engine with a significant power advantage. This was done knowing that the "forgotten" loophole would be closed immediately after they took advantage of it, and so the engine would in fact be usable only for this single race. Starting from 1995, Mercedes-Benz rebranded the Ilmor engines and achieved six wins in their first full season, also reaching second in the drivers championship powering Al Unser, Jr. After a dry spell in 1996, Mercedes-Benz came back in 1997 with eight wins and winning the Manufacturer's Championship. However, a lack of competitive results in the following seasons and the CART/IRL split meant Mercedes gradually lost interest and the German manufacturer abandoned American racing at the end of the 2000 season, with a total of 18 wins and one driver runner-up finish in the CART championship. On 28 January 1938, Rudolf Caracciolo set a Land Speed Record of 268 mph over the flying kilometer, Mercedes-Benz W125 Rekordwagen was an experimental, high-speed automobile produced in the late 1930s. The streamlined car was derived from the 1937 open-wheel race car Mercedes-Benz W125 Formel-Rennwagen, of which also a streamlined version was raced at the non-championship Avusrennen in Berlin. This Record remained the fastest ever officially timed speed on a public road until broken on 5 November 2017 by Koenigsegg in an Agera RS driven by Niklas Lilja, achieving 276.9 mph on a closed highway in Nevada. It also was the fastest speed ever recorded in Germany until Rico Anthes bested it with a Top Fuel Dragster on the Hockenheimring drag strip. This record breaking run was made on the Reichs-Autobahn A5 between Frankfurt and Darmstadt, where onlookers were rattled by the brutal boom of the side spewing exhaust stacks as the silver car hurtled past. By nine that morning, Caracciola and team chief Alfred Neubauer were having a celebration breakfast at the Park Hotel in Frankfurt. Sadly, popular driver Bernd Rosemeyer was killed later the same day when trying to beat that record for Auto Union. This also put an end to the record attempts of Mercedes, even though Hans Stuck later wanted to beat the overall land speed record with the Porsche-designed Mercedes-Benz T80 which was powered by a 3,000 horsepower (2,200 kW) airplane engine. On August 13–21, 1983 at the Nardo High Speed Track in southern Italy, the new compact-size W201 190 class, sporting a 16-valve engine, built by Cosworth, broke three FIA world records after running almost non-stop in a total of 201 hours, 39 minutes, and 43 seconds—completing 31,000 miles at maximum speed of 153 mph. It went on to become the 190E 2.3-16 touring model. Mercedes-Benz is currently active in four motorsport categories, Formula Three, DTM, Formula One and GT, even winning the Formula 1 Constructor's and Driver's Championship for the last four years. Over the last 40+ years here at l’art et l’automobile, we have accumulated a vast collection of moments and memorabilia from Mercedes-Benz’s illustrious racing and production career, including many of their triumphs and successes over the decades. 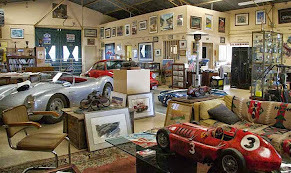 Don't forget to head to our store site for more great automotive memorabilia. We have many more items in our gallery, so do not hesitate to contact us if you are looking for something in particular. And as always, Like and Share us on Facebook, Follow us on Twitter, Share a Picture with us on Instagram and catch up on the rest of the blog below.